The 2016 edition of the Wall Street Journal bestseller Non-Obvious. Featuring 15 NEW trends, summary of EVERY trend from the original 2015 edition and a recap of more than 75 previously predicted trends! How does the dramatic decline of golf explain the boom in sales of music on vinyl? What can the world’s most exclusive restaurants teach you about the future of consumption? What cultural trend unites a transgender six year old, a Somali supermodel, and a Canadian prime minister? The answers to these questions may not be all that obvious. And that s exactly the point. 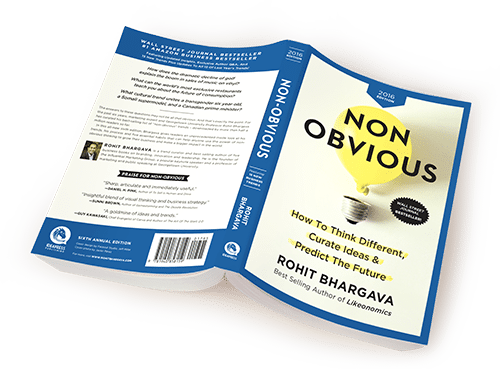 For the past 5 years, marketing expert and Georgetown University Professor Rohit Bhargava has curated his best-selling list of non-obvious trends by asking the questions that most trend predictors miss. It s why his insights on future trends and the art of curating trends have been utilized by dozens of the biggest brands and organizations in the world like Intel, Under Armour and the World Bank. In this all-new sixth edition, discover what more than half a million others already have: how to use the power of non-obvious thinking to grow your business and make a bigger impact in the world. 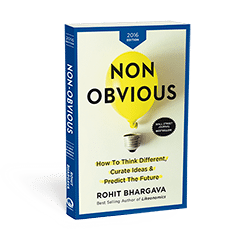 Non-Obvious is filled with entertaining insights like what the world’s most exclusive restaurants can teach you about the future of consumption or how experiments at the most advanced elementary schools on earth are changing marketing. Strategic Downgrading – Why a rise in connected devices is leading some consumers to prefer and seek out older inferior versions of products and services. Automated Adulthood – How a wider range of services is helping emerging adults to ease their way into independence and grow up slowly – or sometimes not at all. Virtual Empathy – How a rise in virtual reality experiences will lead to greater human and corporate empathy due to the immersive ability to see the world through foreign and unfamiliar eyes. In total, the Non-Obvious 2016 Edition features 15 all-new trends for 2016 across 5 categories including Culture & Consumer Behavior, Marketing & Social Media, Media & Education, Technology & Design plus Economics & Entrepreneurship. The book also takes a deeper look at the 15 predicted trends from the original publication in 2015 – offering detailed updates and new insights for each of those previous trends as well. 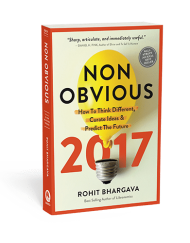 Finally, Non-Obvious takes a brutally honest look back at more than 60 previous trend predictions from 2011 to 2015, providing an honest assessment of what came true, what was a dud, and why it matters – including detailed reviews and insights for 15 trends from 2015 and a NEW bonus Q&A interview with the author. Isaac Asimov once wrote that he was not a speed reader, but he was a speed understander. If you want to improve your business or your career by seeing those things that others miss, and becoming a speed understander for yourself, this book can help you get there.